It’s game time. Whether you’re excited for the Superbowl or the Oscar’s, make these for your next party! We were in Seattle last year in time for the big Seahawks vs. 49ers showdown. The atmosphere was tense and exciting, and it seemed like everyone in Seattle was a fan–which explains the 12th man. It was so different from the Bay Area’s reaction to football that I became a Seahawks fan in less than a week. Now, I’m not saying I’d root for Seattle over the Pittsburgh Steelers or anything, but when it comes down to it, I’ll be tense in those final moments, hoping for that miraculous touchdown or field goal to carry the Seahawks into victory. 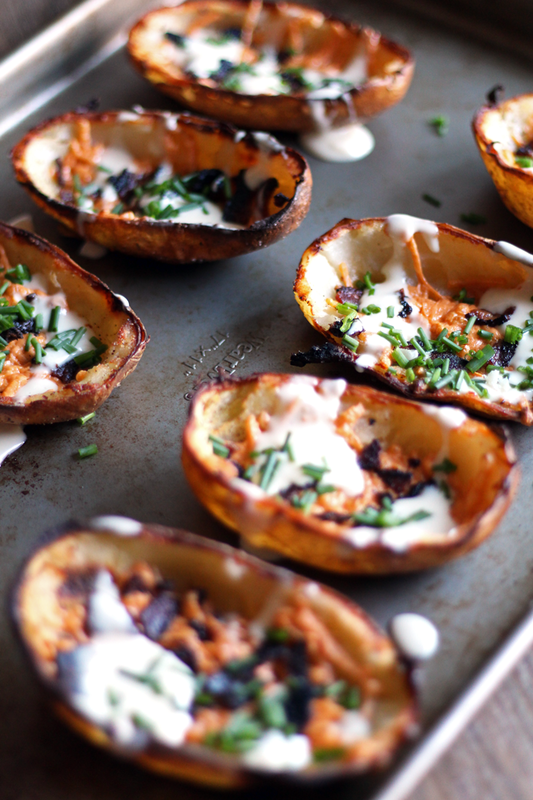 But mostly, I’ll be watching sappy Budweiser commercials and eating these loaded cheesy potato skins. 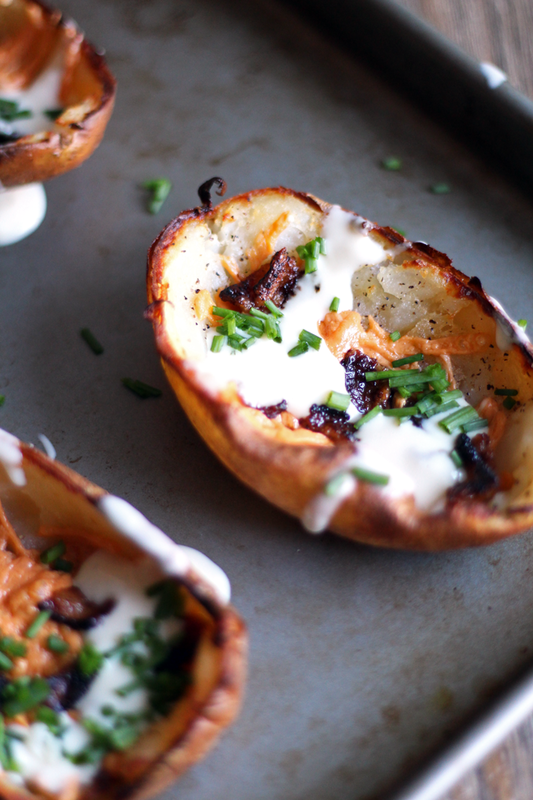 Crispy, buttery, cheesy, bacon-y, these pair perfectly with an ice cold beer on game day. Even your dairy-loving friends will find these delicious! Just make sure to use a tried and trusted vegan cheese that you know performs well. 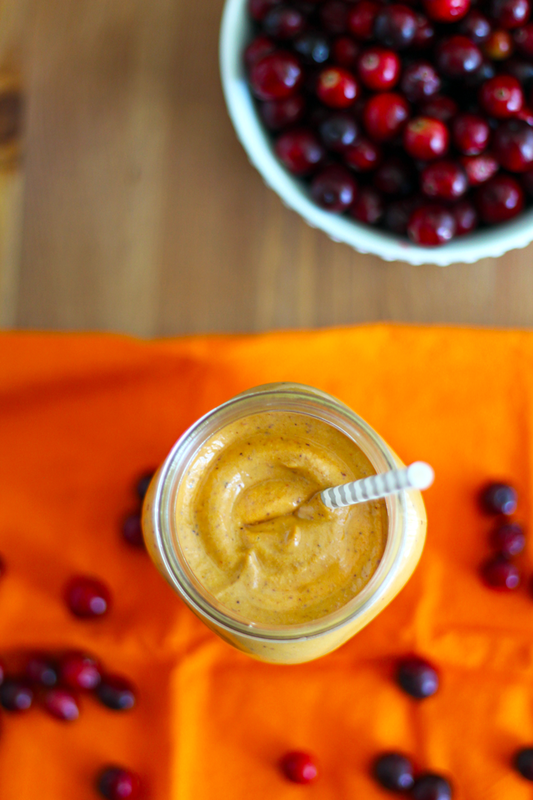 I used Daiya, but I would also recommend soy cheese–it tastes the most authentic. 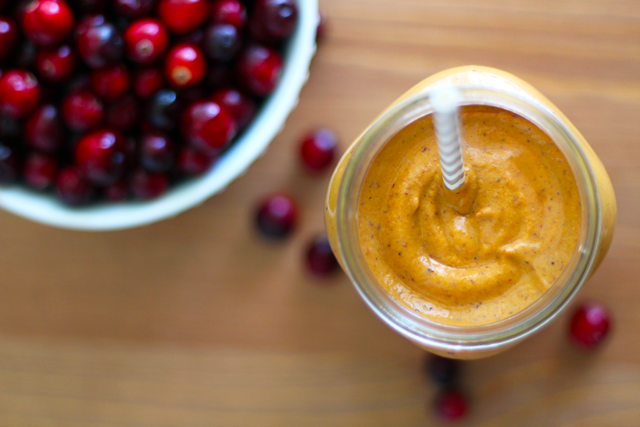 I choose sweetened almond milk because it tastes closest to real milk, but feel free to experiment with other non-dairy milks and see what you come up with. Enjoy! Heat oven to 400 degrees Fahrenheit. Pierce each potato on each side with a fork. Place the potatoes directly on the oven rack and bake for 50 minutes, until the skins are crisp and the potatoes tender enough to cut. Transfer to a wire rack until cool enough to handle. Meanwhile make your cheese sauce and set aside. Set oven to broil on high. Slice each potato in half lengthwise. Using a spoon, scoop out the flesh, leaving about 1/4 inch intact. Brush the insides of the potatoes with melted vegan butter and sprinkle with salt and pepper. Flip the potatoes over, brush the skin sides with butter, and sprinkle with salt and pepper. Evenly space the potato halves skin-side up on a baking sheet and broil until the skins start to crisp, about 2 to 3 minutes (keep a close watch so they don’t burn). Flip the potato halves over and broil until the top edges just start to brown, about 2 to 3 minutes more. Evenly fill each skin with vegan cheese and crumbled bacon. Place in the broiler and broil until the cheese is melted and bubbling, about 4 to 5 minutes. 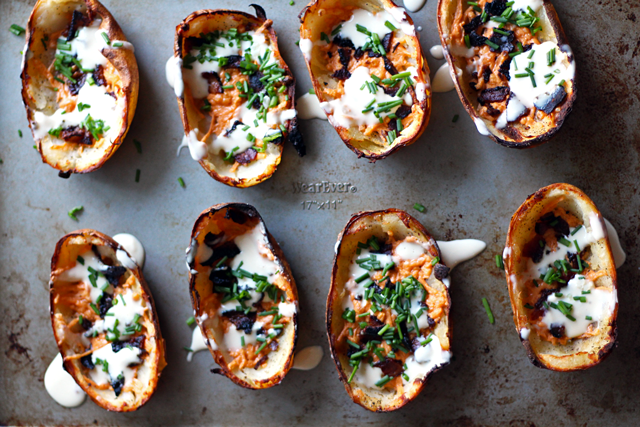 Remove from the broiler and drizzle with white cheese sauce then sprinkle with chives. Serve immediately. In a small saucepan over medium heat, bring almond milk to a simmer. Add vegan mozzarella and whisk until smooth and thickened. Remove from heat. *I used Earth Balance Buttery Spread. **I used Daiya Cheddar Style Shreds for the filling and Daiya Mozzarella Style Shreds for the cheese sauce. ***I used Almond Dream Original Almond Milk. 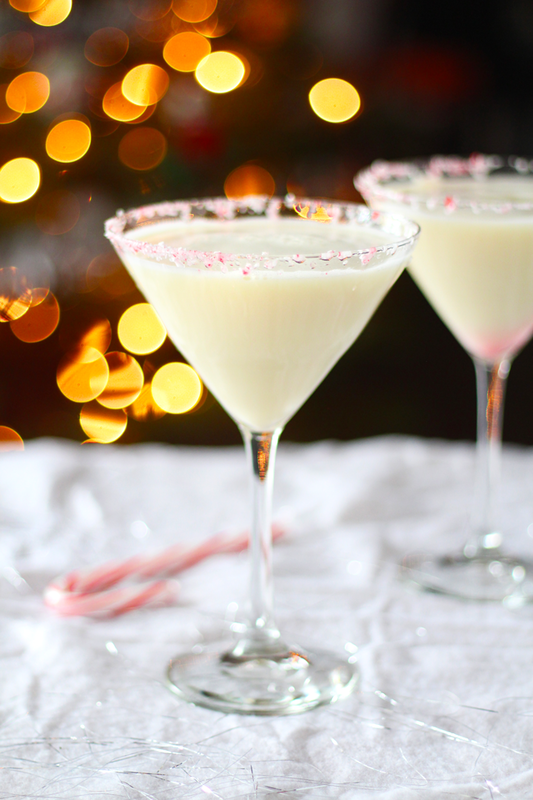 The holidays are the best time to try those creamy cocktail recipes. 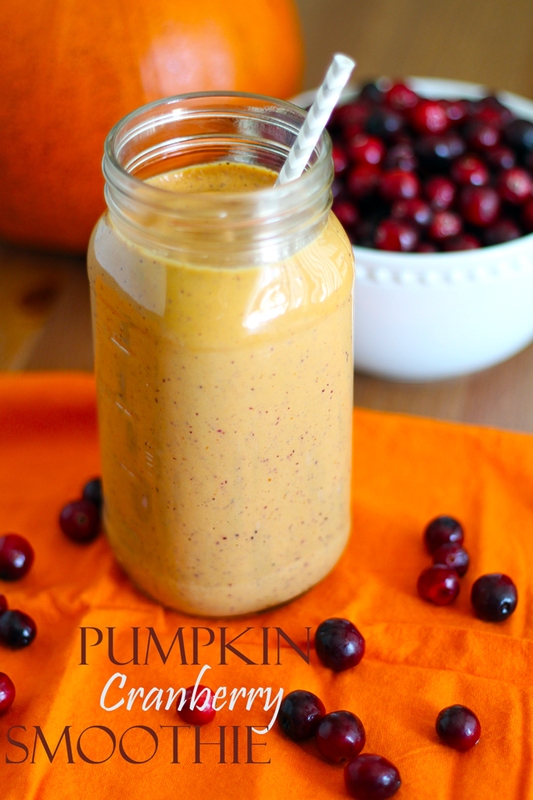 I haven’t been able to find a dairy-free creamy liquor, so I concocted my own. 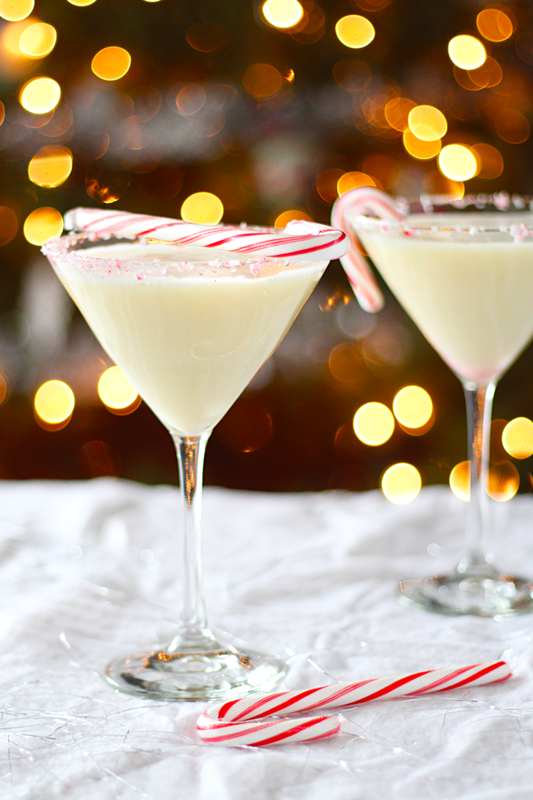 With a crushed candy cane rim, vanilla soy milk, vodka, and schnapps, this pepperminty cocktail is a sweet and satisfying after dinner treat. 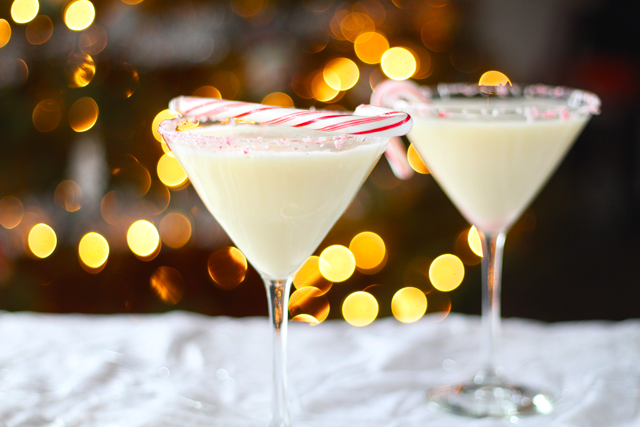 I hope you enjoy it this holiday, maybe with some vegan whipped cream and a candy cane dipped in your glass. This Christmas we are staying in California, rather than joining the travel craze and venturing to the cold east coast. Though I’m not going to lie, I miss the winter season around the holidays. There is something about Christmas and cold weather and snow that goes so well together. I’ll miss the cozy fires my dad makes and the excitement of opening presents with my family. It will be sad not to be able to see their faces when they unwrap my gifts. But Eric and I have created our own little traditions out here in sunny California over the years. 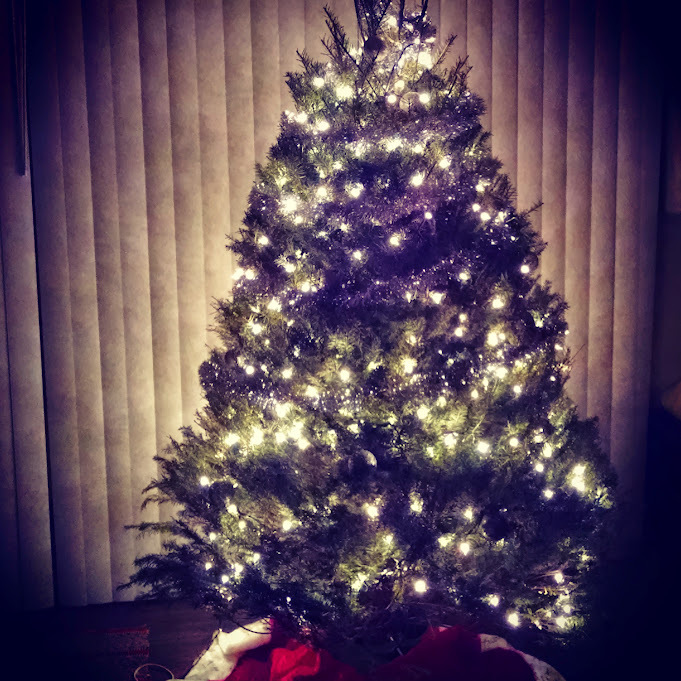 We still put up a live tree (although I wouldn’t exactly call our current tree alive), hang up stockings decorated with puff paints, and wrap presents for each other to have surprises on Christmas morning. We wrap little bones and treats for Mia, who loves opening gifts, especially if there’s something chicken flavored inside. The best part of the day is the time to relax, to enjoy the time together without the stress of work and daily demands. Christmas is a time for giving and spending time with the people we love. And I love my little family. Unwrap candy cane and place in a ziploc bag. Crush with a mallet or rolling pin and pour candy cane bits onto a small plate. On a second small plate, pour a little bit of vanilla vodka. 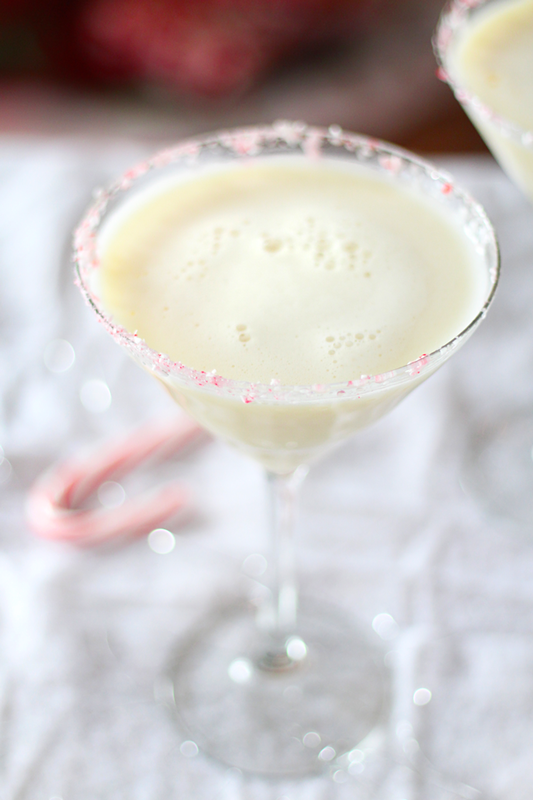 Dip rim of martini glass in the vodka and then in the crushed candy canes to line. 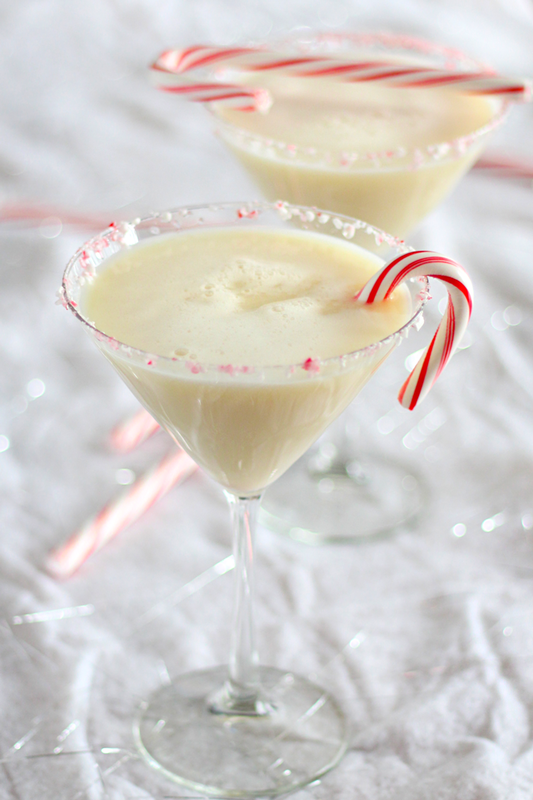 In a martini shaker, add soy milk, schnapps, vodka, vanilla syrup, and a few ice cubes. Shake for 30 seconds and strain into martini glass. I used Silk Very Vanilla Soymilk and Torani Vanilla Syrup. For the past three Novembers, cooking for Thanksgiving has been very last minute and a lot harder. I was reluctant to even get into the holiday spirit until December 1st. Have you ever heard of this little thing called NaNoWriMo? It’s short for National Novel Writing Month. It’s true, I am an aspiring novelist. I have been since I was in middle school, although practicality and life always got in the way of trying to achieve my dream. Then I heard of this NaNoWriMo thing: a non-profit organization that challenges you to write an entire novel in November. 50,000 words that is. In thirty days. The first year I heard of it I thought maybe I’d give it a shot. I toyed with the idea. I wrote down some stories that had been fighting for recognition in the back of my mind. But I never went through with it. Maybe I was just focused on other things. The year after that, 2012, I put my foot down. I was going to do it. But when I picked my story and sat down to write, I had a huge wake up call. Writing 50,000 words is hard. Writing them well is even harder. I had an embarrassing collection of 25,000 words by the end of the month. But last year, that was when I finally did it. I wrote 50,000 words, adding to my previous attempt at the same story for a total of 78,000 words. I had written a novel. Check one box off the bucket list. The problem was, it was absolutely horrible. I spent the next year going back to it again and again, editing and editing and trying to make it readable. I don’t regret all this time spent editing. It was a major learning experience. Because this year when November came around, I found my writing to be majorly improved. Not only have I written 45,000 words before Thanksgiving, but I’ve also kept my apartment clean, gotten into the holiday spirit, and have even kept up a regular social schedule, along with posting blog entries and doing my day job. To be so much more improved has been a huge confidence booster. It is true that hard work pays off. I’m looking at a really great story right now, one that I am not reluctant to share unedited. One that I am in love with. 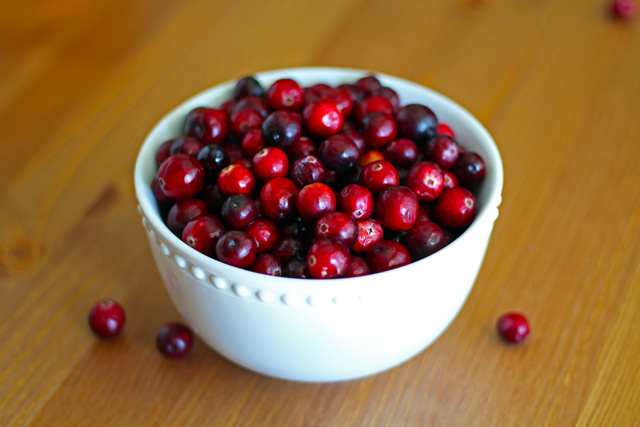 And here I am comfortably posting another recipe, with Thanksgiving only days away. I just want to say to follow your dreams. It’s going to be hard. There are going to be things in the way. And maybe you won’t get it on the first go. But keep trying. Eventually, practice may not make perfect, but it will get you farther than you ever thought possible, even in your darkest moments of despair. Three years ago, writing a novel was a daunting task. But now? 50,000 words in a month? No biggie. I got this. 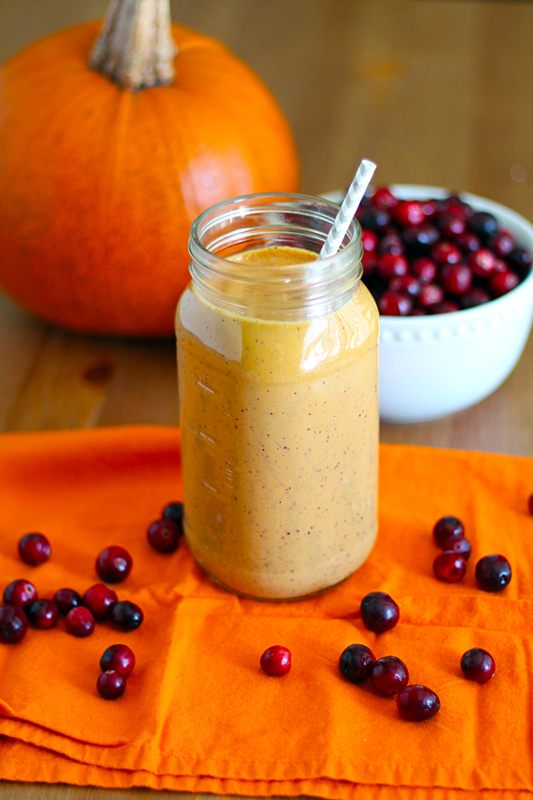 And just to prove it, here’s a deliciously thick and fluffy smoothie with a tart, creamy finish, made from the Thanksgiving dinner ingredients you already have in your kitchen, to help get you into the holiday spirit, too. 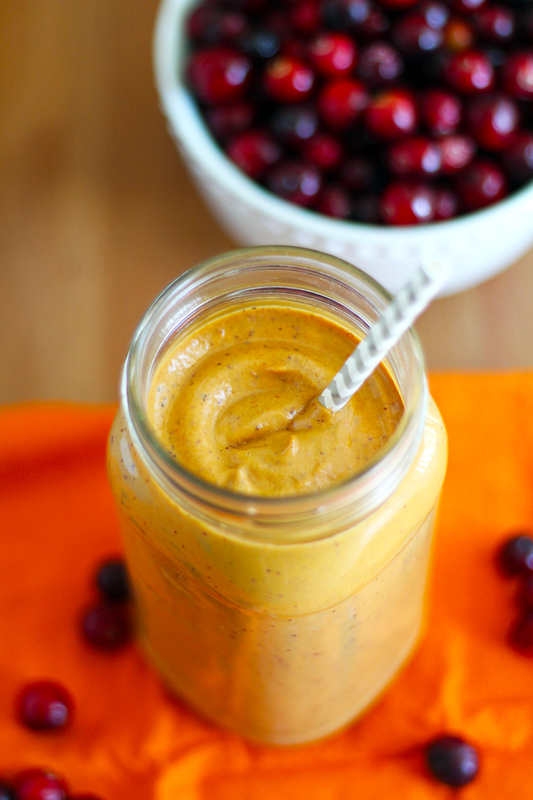 Combine all ingredients in a high speed blender and blend until smooth. Sweeten with maple syrup to taste.